It all began with a vision. 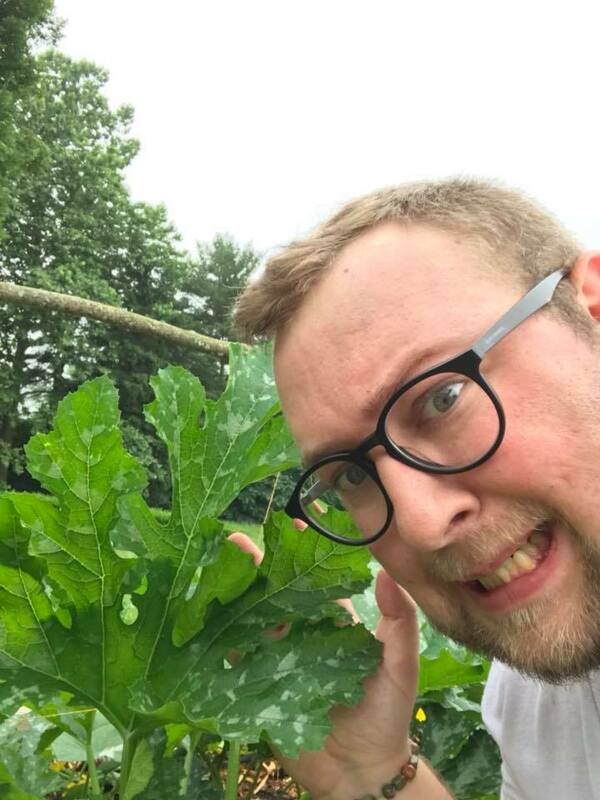 While attending seminary at The School of Theology in Sewanee, Tennessee, Fr Joshua Nelson’s class planned and planted the first Seminary Community Garden based on a concept learned in Old Testament studies. In Leviticus 19:9-10, God commands the people of Israel, “When you reap the harvest of your land, you shall not reap to the very edges of your field, or gather the gleanings of your harvest. You shall not strip your vineyard bare, or gather the fallen grapes of your vineyard; you shall leave them for the poor and the alien: I am the Lord your God.” (NRSV). Based on this principle, the seminary garden became known as a Corners & Edges Garden, serving the seminary and Sewanee community. First planting of the Unity Garden at Saint David’s, Elkhart. When Father Joshua made his first visit to St David’s in December 2016, he looked out the west windows of the nave. Through the snow, he could see the outline of a sidewalk in basilica form with a bell on the east end and a wooden cross at the west. He enquired what was beneath the snow. Upon hearing that it was a grass lot he received a vision of the space converted into a garden. 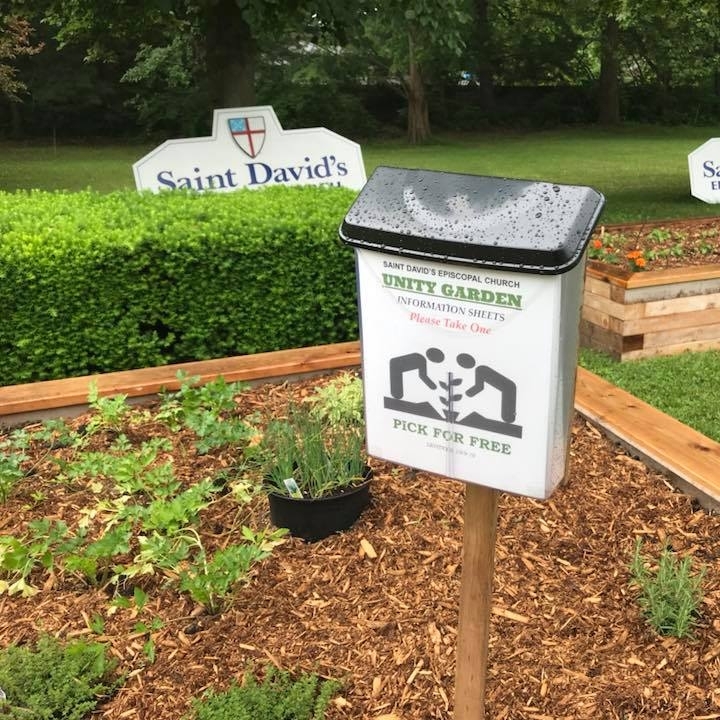 After arriving to take up the position of priest-in-charge, it became clear through conversations and off-sided comments with various parishioners, that God had been quietly planting such a vision with this community of St David’s for quite some time. Fr Joshua drew out plans for seven raised beds to surround the close. 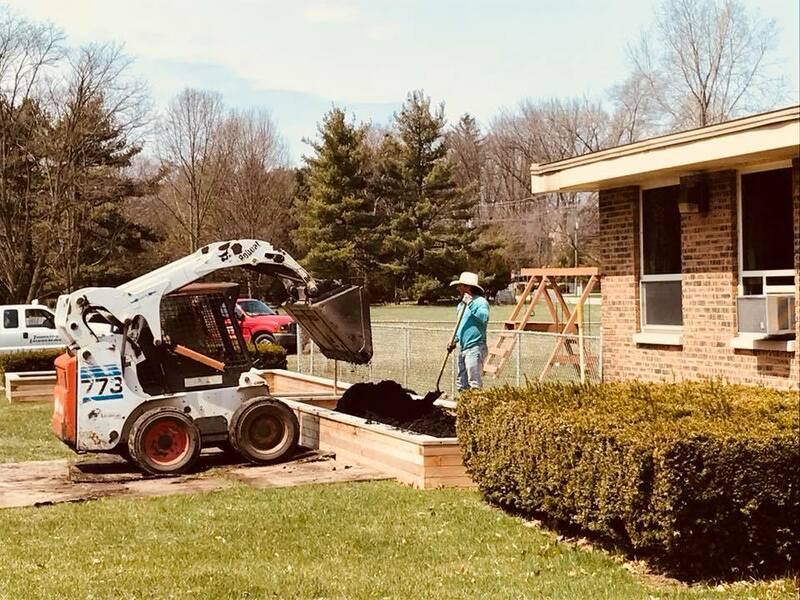 When presented to the vestry, the vision was met with great excitement and one family offered to cover the cost of construction. 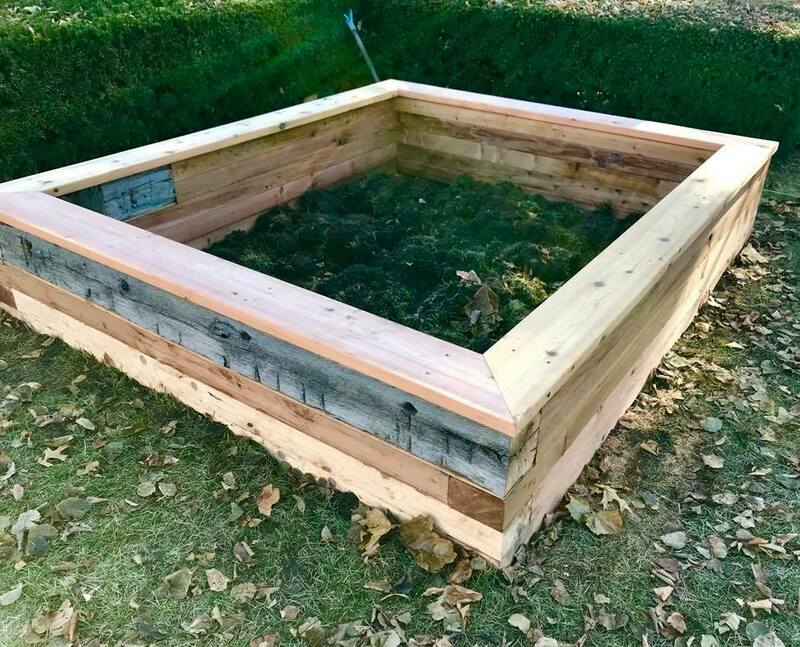 In the fall of 2017, seven large raised beds (four 25’ x 5’ rectangles and three 6’ x 6’ square boxes) were made. All the boxes are 3’ high, constructed of cedar planks with a 6” cap for seating. It was our hope that this design would make planting and harvesting accessible to all. In August of that year, one of the sons of the parish was married and the father of the bride constructed a large oak cross for the ceremony. Upon hearing of the garden project he donated the new cross to the parish in thanksgiving for the marriage. It would replace the old oak cross which stood in the close. The old cross was handmade of century-old oak salvaged from the barn of one of the charter families of St David’s parish and for nearly three decades had hung on the wall behind the altar before being replaced by a brass and rod iron crucifix which hangs there today. The verticle beam of this old cross was cut to size and incorporated into the walls of one of the square boxes of the garden, ensuring this blessed symbol would remain a part of St David’s for years to come. Over the winter the boxes filled with snow and stood for the community to hope for what might be. With the thaw of late April, the boxes were filled with a combination of rich soil and mushroom compost. On the Spring Rogation Day, members of the congregation gathered for a litany procession around the bounds of this new garden as the boxes and cross were blessed by words, songs, and the sprinkling of Holy Water. That evening was doubly special as we then gathered inside for the Mass and the internment of one of our dear member's cremains to the Calibarium of the Holy Cross, which stands near a window overlooking the newly blessed garden. We buried our Sister in the hope of resurrection, we blessed the dead earth and dried seed in the hope of new life to come. As the mass continued the clouds opened to a brief but full spring shower as the Spirit of God too descended upon this new project. The work was done yet just beginning. It was decided early on that the Garden would be a Unity Garden,as well as fully organic so it would be safe for anyone at any time to harvest.Unlike a Community Garden which rents or hold allotments for various members of a co-op-like organization to plant, tend, and harvest of their own space, a unity garden functions fully for others. Our faith community would plant and tend the space, harvesting as was necessary, but leaving the bulk of the blessings for any and all who wished to partake. Not only would this be a place to be fed in body but also in spirit. The close now serves as a Creation Chapel, where all may come to sit, listen, pray, play, and pick of all that God has to offer. At the entrance to the garden stand two plastics cases; one with bags to carry produce and the other with fliers of information. They tell about the garden, what is planted, how to harvest and keep it, as well as health benefits and some recipes. The first year of this new ministry has been a great success. God has blessed us with a bumper crop. Although we had a few lessons to learn about pruning and cabbage worms, the growth began to overspread their allotments. It became a regular practice for parishioners to arrive at the parish hall early on Sunday to spend some time in the garden before Mass, and then return to the garden to take home some herbs and vegetables for Sunday supper. Members of the community would stop by after work to either pick of the bounty or simply play in the dirt and spend a few moments communing with God in the midst of creation. A few times the days picking was very full and we were blessed with great abundance. Sacks of freshly picked produce were given to our neighbors at North Pointe Apartments and Mary Feeser Elementary School free of charge and with an invitation to join us in reaping the fruits of the harvest. Families began coming together. Parents were introducing their children to the lessons of the garden and made use of a seat in the shade or the parish playground. One day Father Joshua decided to set up a donation Farmers Market in front of St David’s. This provided even more opportunity for conversation, evangelism, and getting to know our neighbors. All the produce was free for the taken, we simply asked for a donation to promote the work of the Unity Garden. As the summer ends and the winds change their direction, the garden teaches us to observe the seasons of life. Herbs are cut and hung to dry, later to be placed in jars and used through the coming months. The last of the fruits are pickled or frozen as dead plants are removed and the ground is prepared for winter. The parables continue as we cover the perennials with leaves and straw, entombing them until they break forth next spring to once again sing the glory of God, inviting us to the alter of creation and building the bridges of grace into our community.